Choose From: 1 3/8" Diam. X 1/2" Thick - No Hole (56 Pcs. available) - $.45/ea. 1 3/4" Diam. 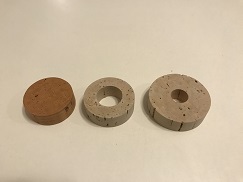 X 1/2" Thick X 1/2" Hole (70 Pcs. available) - $1.00/ea. 1 1/2" Diam. X 1/2" Thick X 3/4" Hole (25 Pcs. available) - $.75/ea.